Liberty Valance redux looks to be on its way into production with some slight changes. According do Deadline.com, John Ford’s classic western will now be about the NY Drug Wars of the 1990s. 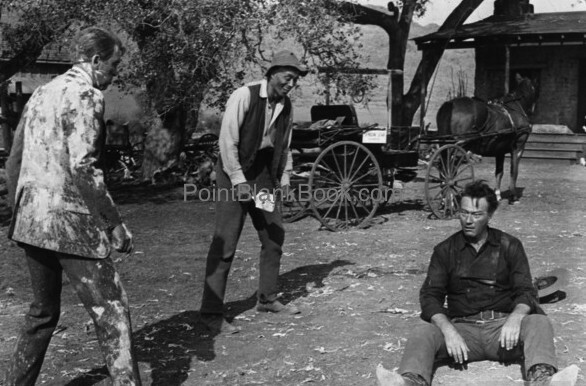 The 3 principal cast members of THE MAN WHO SHOT LIBERTY VALANCE (L-R): Jimmy Stewart (Ranse Stoddard), Lee Marvin (Liberty Valance) and John Wayne (Tom Doniphon). Movie purists will angrily shake their fists at such blasphemy but before they do, there’s some things to keep in mind, so take a deep cleansing breath…..
Liberty Valance toying with his prey on the streets of Shinbone before the big finale. – John Carpenter did the same with Howard Hawks’ classic western Rio Bravo (1959), by updating it to Assault on Precinct 13 (1976), which itself was later remade in 2005. – Hawks also bastardized the tale himself over the years with both El Dorado (1967) and Rio Lobo (1970), all three of which starred John Wayne. So much for acting and directing legends maintaining the integrity of their careers. – Oh, I know Rio Bravo Redux is not Liberty Valance Redux. 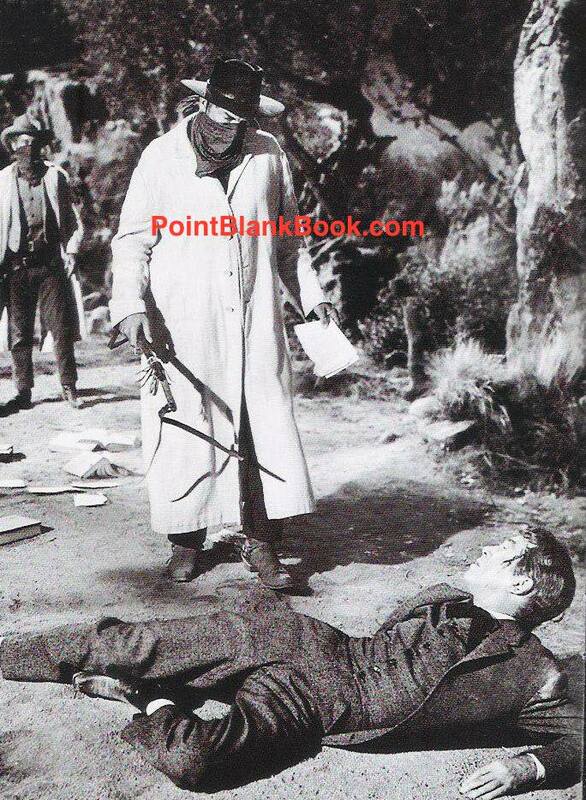 For the record, it’s also not the first time The Man Who Shot Liberty Valance has had a redux..of a kind. There was a stage play mounted in London a few years back that received surprisingly good reviews. 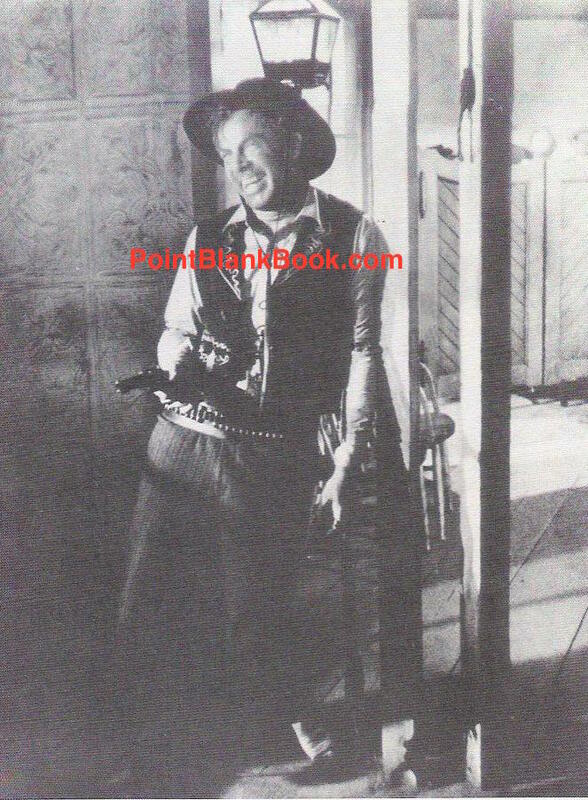 For Lee Marvin’s opening scene in the film, readers of LEE MARVIN POINT BLANK know the real reason he’s wearing the bandana over his face. – Also, an updated remake of Liberty Valance has been bandied about for a while now as I had blogged about it back in 2015. As you can see by the blog entry, I’m certainly not defending the idea of an updated remake. Quite the contrary. It’s just that I think in this day and age we should no longer be either shocked nor surprised by such things. Sadly, it is the way of the world we live in. Besides, to paraphrase the famous line in the film, “When the truth becomes the legend, (re)print the legend.” Would you expect anything less from Hollywood? Since Monday, January 15th marks the 88th birthday of Rev. Dr. Martin Luther King, I thought I’d take the opportunity to recount Lee Marvin’s contribution to civil rights during the 1960s. Granted, it is indeed an extremely minor contribution compared to Dr. King and other civil rights leaders but in his own way, Lee indeed contributed. One would think, based on his upbringing, that Marvin would hardly be in favor of civil rights and equality for all races, particularly African-Americans. His mother Courtenay Marvin was an old-world southern Virginian and all that would entail. However, his father Monte Marvin had been in command of a black calvary unit during WWI and had a much more liberal view of African-Americans. Then again, according to Lee’s brother, Robert, both parents hit the roof when Robert briefly dated a young black woman. And yet again, both boys were cared for by a black maid named Erlene whom they adored. Growing up on the eastern seaboard also meant encounters with various races throughout their formative years, resulting in a rather different view of black people than the one held by their parents. All that said, Lee Marvin was still very much a product of his time and not above using racially-charged language. However, if one believes that actions speak louder than words, even in those less enlightened times of the early 1960s, Marvin’s more liberal attitude was very much in evidence. Case in point: his lifelong friendship with black actor, Woody Strode. They met during the making of John Ford’s The Man Who Shot Liberty Valance and remained tight for the rest of their lives. 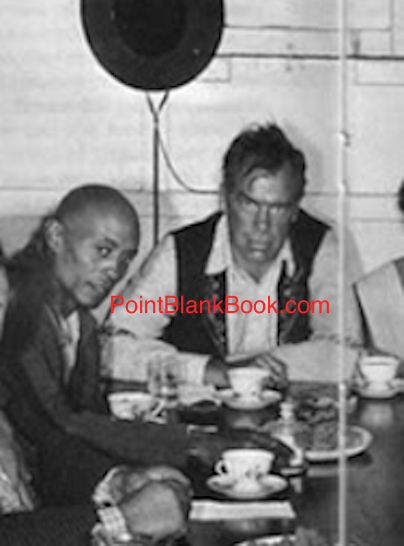 Although they had no scenes together, Woody Strode (left) and Lee Marvin are pictured at a cast ‘tea party’ during John Ford’s The Man Who Shot Liberty Valance. I was extremely fortunate to get what I believe to be the last interview with Strode. His love of Lee Marvin (as well as John Ford) knew no bounds. Their hilarious initial meeting on the set of the film is well-documented in Lee Marvin Point Blank. Strode, by the way, was not as happy working on the film with Hollywood icon John Wayne. Consequently, he did enjoy watching Ford tease both James Stewart and Wayne unmercifully for the sake of the performances he wanted from them. Like Ford, Marvin also teased the two conservative Republicans, particularly, Stewart. Reportedly, he needled Stewart by telling him that when the black man rises up, Stewart had better be rightfully frightened in his sleep. He may of course simply had been in character as Liberty Valance but such comments rankled Stewart and tickled both Strode and Ford. Woody Strode (center) clearly enjoys seeing John Wayne (right) dumbfounded by Jimmy Stewart’s belt in the mouth in The Man Who Shot Liberty Valance. Several years after Liberty Valance, Marvin and Strode appeared on screen again, this time in Richard Brooks’ underrated western adventure, The Professionals. 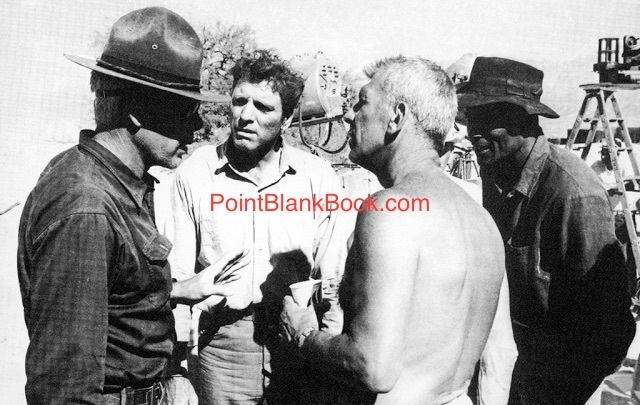 Lee Marvin discusses a scene with Burt Lancaster, writer/director Richard Brooks and Woody Strode on the Set of The Professionals. It remains one of Marvin’s best films and should be required viewing by any fan. 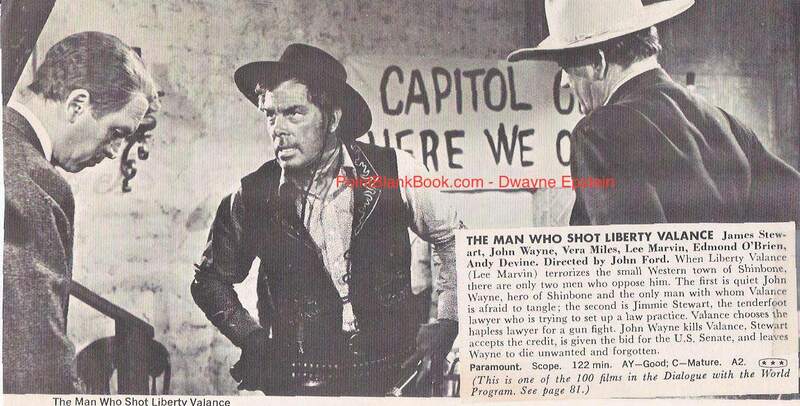 According to Woody Strode, it was Lee Marvin who managed to get Strode earlier screen time in the film. Again, all is explained in Lee Marvin Point Blank and is not said to deter from Burt Lancaster in any way. The man was only human and had his own foibles and insecurities as anybody else does. In fact, Strode explained to me why he only appeared in the outfit he wore in his opening scene, only in that opening scene. Want details? Gotta read the book. 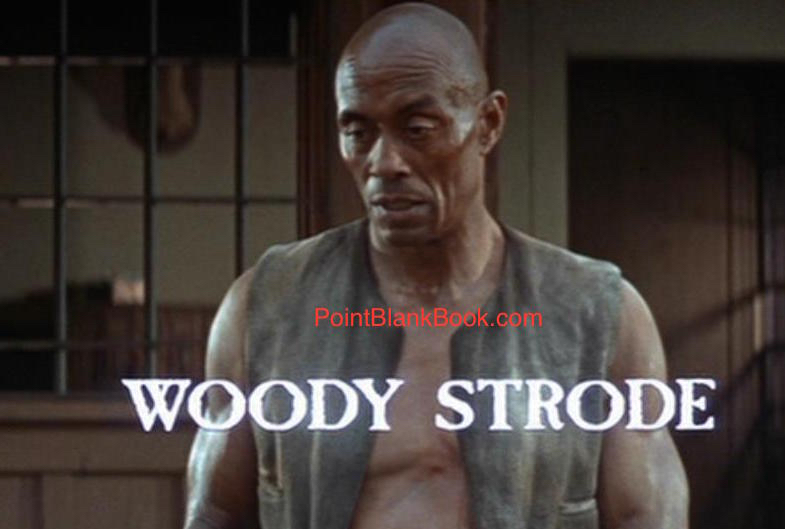 Woody Strode as he appeared in the opening title sequence of The Professionals. As was said, they were like brothers. If that’s not a worthy story for Martin Luther King’s birthday, I don’t know what is. On this date in 1962, John Ford’s The Man Who Shot Liberty Valance premiered and it’s production, reception and legacy is fully covered in Lee Marvin Point Blank. Readers will discover how the cast REALLY got along during the filming, what John Ford thought of his new but late-in-the-game stock company member, Lee Marvin, why Lee Marvin’s son considers it his favorite film, what he said when introduced to John Wayne and infinitely more! Most exclusive of all was an interview with the late, great Woody Strode and his personal take on what happened on set and why he loved Lee Marvin. However, to honor the occasion, here a few strange tidbits from the past to pay tribute to the last great John Wayne/John Ford western that were not included in the book. Pre-release movie magazine teaser ad for LIBERTY VALANCE. This strange ad above is the kind of thing you just don’t see any more, and maybe that’s a good thing. What’s with the nursery rhyming scheme? Did the publicity dept, think anxious film fans would put it to music and sing these little ditties to help promote word-of-mouth? Bizarre. Did these folks even seen the film? Andy Devine’s character of Sheriff Link Appleyard hardly lived to help ‘the ones in need.’ The one for Valance isn’t even accurate. He didn’t spread shame. He spread pain! 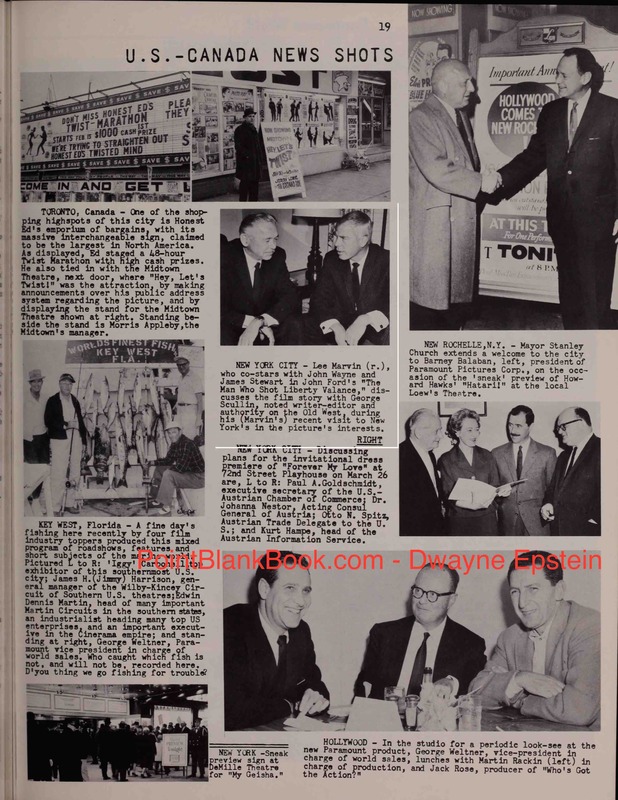 Then there’s this ‘Behnd-the-scenes’ article from the June, 1962 issue of Screen Stories. 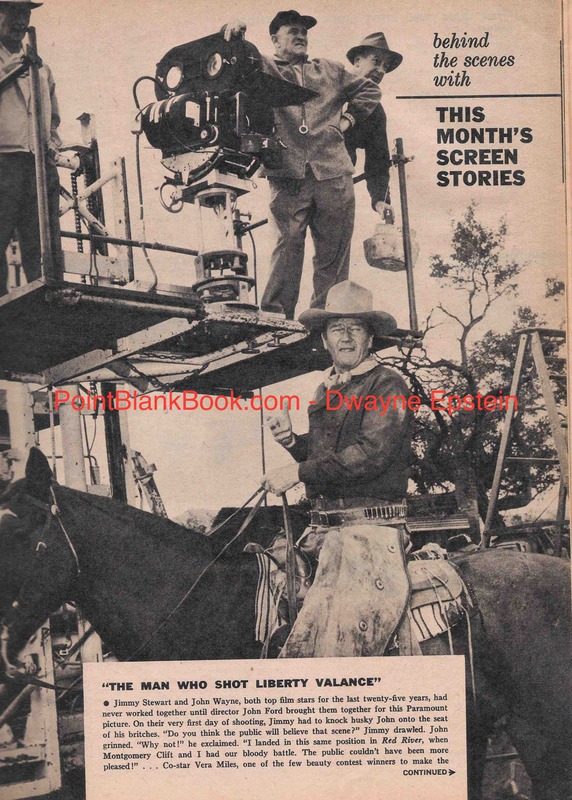 Screen Stories 1962 article on the making of LIBERTY VALANCE. You can already tell from the opening that a good portion of it was a result more of p.r. than it was actual onset reporting. That’s fine in the long run, I guess, but it also has some interesting trivia, such as the fact that the entire male cast were each 6-foot tall or taller! Behind the scenes article, page 2. And there’s this review, which explains why the movie took a while to get an audience. Not only does the reviewer spell Jimmy Stewart’s name wrong, he commits the ultimate sin of a reviewer by giving away the ending…and then rates the film a C-! Movie rag…er…mag review of LIBERTY VALANCE. Is it any wonder I dislike most critics? Ahh well. Never mind the critics. Just enjoy the great film for what it is: One of Lee Marvin’s best performances and a lasting testament to what John Ford contributed to the American Western: When the truth becomes the legend, print the legend. 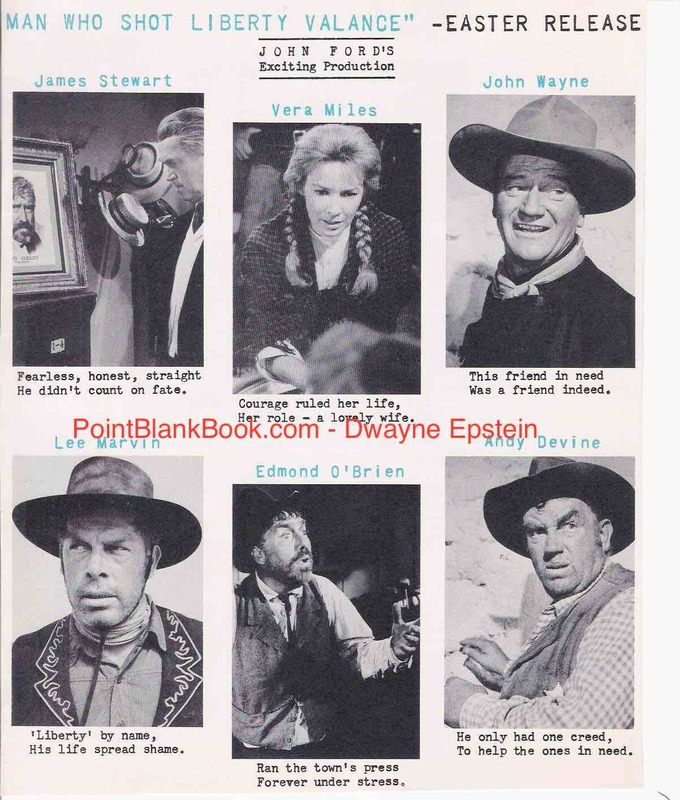 Smack dab in the center is Lee Marvin in the March, 1962 issue of PARAMOUNT WORLD, promoting the release of Liberty Valance.